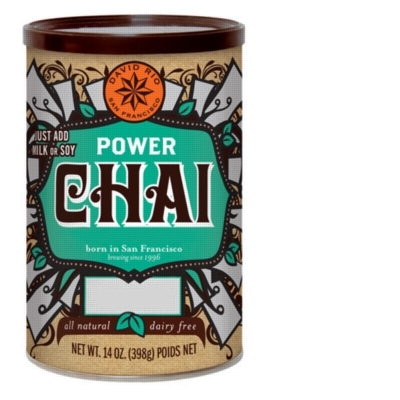 Power Chai is an all natural, dairy-free chai from David Rio. Drink to revitalize, boost, and add a strong kick to your cup of chai! Incorporating matcha to espresso provides each variety with its own perfect complement to the rich flavors of sweet and savory chai. Sip it in your favorite cup with your milk of choice and take in the power of today. All Natural with organic spices, including cardamom, cloves, cinnamon, and ginger. Espresso: Best known in caf�s as a �dirty chai,� Espresso Power Chai is an artisanal product blended with black tea and infused with chai spices, a touch of black pepper, and Brazilian espresso. Matcha Green Tea: The original Power Chai combines Kenyan Black Tea with chai spices and the potent and energizing antioxidants of Japanese matcha. Power Chai is designed to be prepared with milk or milk alternative. INGREDIENTS: cane sugar, maltodextrin, black tea powder, natural flavors, espresso made from Brazilian coffee, natural spice blend, salt.